Roger Ebert is the most powerful, read and listened-to movie critic in the United States, and I consult him as much as the next kitten. Watching film with an obvious love, he has what is hardest to cultivate in any critic: a modicum of good taste. (However, he seems to be cooling on his former love of horror movies [which caused him to rave about Dawn Of The Dead], but with the recent output of the genre, that can be forgiven.) Between Ebert and myself is a curious disconnect: when he gives a movie four stars, I almost always dislike the film, but his 3.5-star titles are my gold. Se7en, Angel Heart, Requiem For A Dream… All the movies that grab me and shake me are, to him, almost great. (Note: this is not a hard and fast rule, just a tendency. Ask me nothing about it.) So I’m a little leery when I read a four-star review by Mr. Ebert. After all, he gave four stars to You Can Count On Me, which I despised. 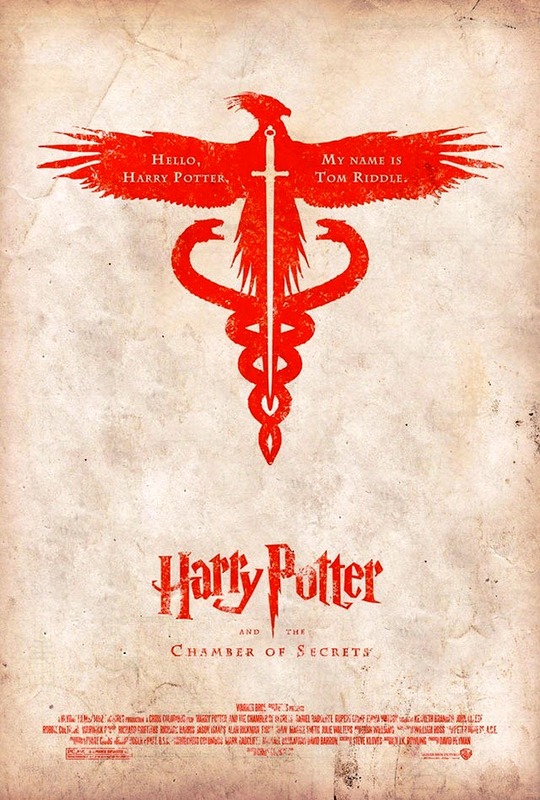 As all tendencies move us inexorably to the conclusion that the universe is cycling into incessant repetition (not the infinite), so does this: I really don’t like the Chamber Of Secrets. As an entertainment – that which passes the time, freeing us from ourselves – it is good. I do not begrudge the movie its running time, and anyway, it moves at a brisker pace than the previous Harry Potter. In the end, it adapts the novel with exceptional fidelity, and that leads to the heart of my criticism. I don’t care that the movie is so close to the book; that’s why I see a film adaptation – to live the written work in a more visceral manner. What I do care about, though, is the lifeless, perfunctory manner in which the events of the book are presented. That the movie entertains is evidence only of the imperviousness of Ms. Rowling’s storytelling ability in this least of Harry Potter books. 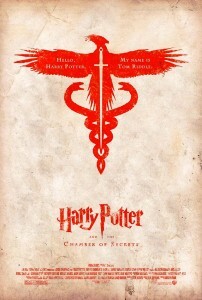 Yep, of all the Harry Potter books, I believe Chamber Of Secrets is the least interesting and the least accomplished. It is the only one in the series that seems like a retread, not a continuing story so much as a ‘sequel’ in the crasser sense. Harry Potter has trouble with his uncle, finds relief at Hogwarts, plays good Quidditch, gets ostracized at school, then saves the day by breaking rules and finding a hidden chamber in Hogwarts. The only differences in the story are the secondary characters (who do very little): Gilderoy Lockhart (Kenneth Branagh), a preening ponce of a celebrity wizard; Lucius Malfoy (wicked old Jason Isaacs), the father of Harry’s chief rival, Draco; and the annoying Moaning Myrtle (though I cannot tell if she is poorly directed or poorly played), a transparent plot device (ha ha). A lot may take place in the movie, but there is little impact. I won’t discuss the plot, since you should know it, but you will miss little from the novel in the film. The problem is that you will not care, save for all that you liked the first time. The film comes together in a deadening fashion of humdrum steady rhythm and senselessness, like a checklist of scenes from the book directed as quickly as possible so that whiny Chris Columbus could go home. To my mind, he is the culprit: Chris Columbus, a director with a stultifying lack of imagination. There’s not a single shot you haven’t seen before, and even the ‘wondrous’ moments are ham-fisted. (Indeed, I imagine little Co’ trying to hold fast to a megaphone that slips through his greasy pig-palms – ham steaks strapped to his hands – shouting “Cut! Print! No new takes! I don’t care!”) Compare the stilted camera movements that ‘sweep’ through Hogwarts, following owls delivering mail, to some of the overhead camera-work in Fellowship Of The Ring. Hells bells, mates, compare it to the first Harry Potter movie! No longer is Columbus enamored of Hogwarts or of the entire world of wizards. To him, it is just some place, so to us it is just some place. The only set that works, in the sense that it feels strange and grand, is the Chamber of Secrets. Like an underground pagan temple, it suggests mystery, whereas the rest of the movie is so assured in audience interest that it doesn’t try at all: It knows that you know what’s going to happen, so why should it even bother with emotion or suspense? And yet I enjoyed watching it. Do I contradict or lie? Nope, kittens, Harry Potter And The Chamber Of Secrets is enjoyable not because Chris Columbus made a good film, (he most certainly did not), but because J. K. Rowling wrote a fine novel that could not be ruined.